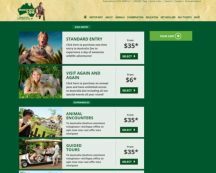 Meet the Zoo Crew, find out how to get a job at Australia Zoo, check out the Zoo Media Centre and find out the latest Irwin family and Australia Zoo news! You can even go back to where it all began and learn about the Zoo’s exciting 40 year history. Have a go at all of the awards Australia Zoo has snagged!